Sorry I am a little late on this one. The federal government passed a bill to lower the mortgage downpayment requirement to 20%. This will really help people in overpriced markets. 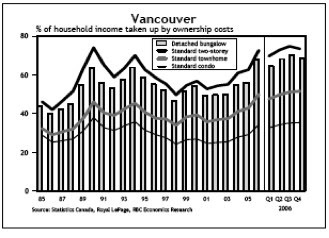 Take Vancouver where housing affordability for a two story home is at 73.5% of local median household income that 5% will make a difference in the outrageous amount new home buyers must save to get into the housing market. No wonder the cottage industry over there is grow- ops in the basement. How else could anyone afford a house?